The Tamworth 3 horse angle load can be made to your transport needs at either a 2, 3 or 4 horse length. Rear vinyl storm cover and all of the quality materials you would expect in an Aussie made float. We also make deluxe angle loads with kitchens, fold down beds and showers...see the Tamworth deluxe angle load page for details. 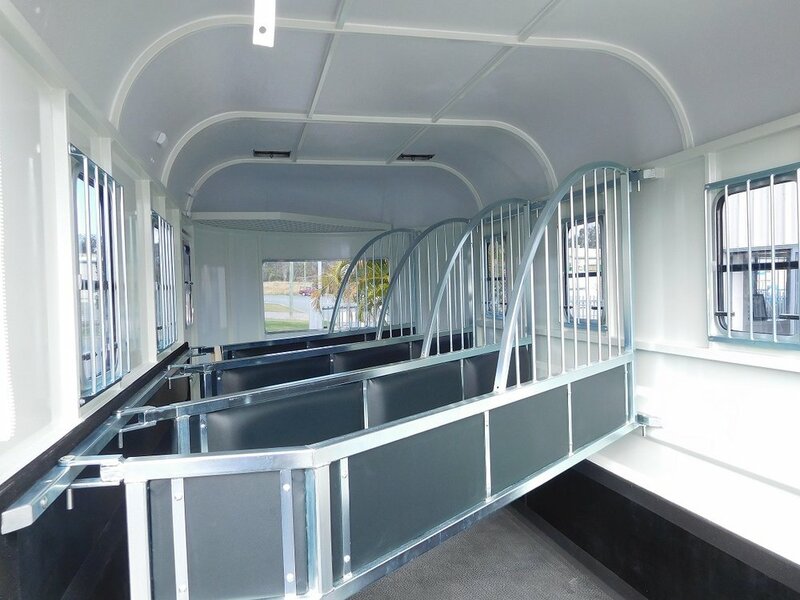 The draw bar of the Tamworth extends straight from start to finish, giving an excellent towing experience and the galvanised 3 mm RHS steel floor bars are spaced at 40 cm minimum giving maximum strength and safety for your horses. The JR is built strong from the ground up right here in Logan Village, QLD. Compare us with the rest and you will see our angles are the best! Our strong chassis is topped by an 18 mm F27 rated hardwood armour ply. It has 6 layers of timber with alternate facing grain...so tough it was perfect after being in flood waters for 3 days in the 2017 floods (with floats 15 years old). It is then topped by a 6 mm hammer rubber and then sealed around all edges with a rubber spray seal. Alternatively we offer a Thermolite fibreglass composite upgrade for your flooring (but you don't really need it as our floats are made tough to withstand the heaviest of horses and years of moisture)! Options include stallion dividers, extra air vents, thermo-lite flooring, external checker plate tack boxes, awnings, bars on windows, metal storm door). See options page below trailers. Price on application. We freight all over Australia. Bay length 2.40 m (standard in industry is 2.250). See our gallery above: Please note that our bays are extendable from 2.4 to 2.6 m long. They are fully removable also, so your horse trailer is versatile for the farm or whatever you need.